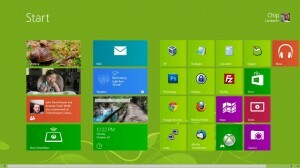 Home → Blog → Is Windows 8 Ready For You? This weekend I decided to take the plunge and upgrade to Windows 8. I was coming from a Windows 7 system running on a fairly budget laptop. I did this to get ready for the influx of support requests that normally come when any OS upgrade is released and so I could test things out and advice people if the upgrade was worth it. I opted to go the download route from the Microsoft Store. After purchasing the upgrade and waiting for the roughly 3 hour download, the install began. I was notified that all of my existing programs would work fine, except for the ATI graphics card driver. I chose to proceed. From this point you basically sit and wait as your computer reboots several times. After about 30 minutes the upgrade was complete and I was running Windows 8. The first thing I always do is reboot the system to see how long the start up takes, and wow does Windows 8 boot quick! Once you log in you are presented with the new metro interface. From here you can launch all of your programs, and setup the tiles however you like. This Start screen also replaces the old start menu on previous versions of Windows. Clicking the Desktop tile will bring you back to the Windows desktop we are all familiar with. One thing you will notice in the above screenshot, is the start button in the bottom left is missing. The circle icon there is Google Chrome, not the start button. Right here is where most people are going to get stuck. How do you get back to the Start Menu? In the above screenshot, you can see a green square in the bottom left corner now. To get that to pop up, just move the cursor to the bottom left corner. When the square appears you go back to the Start Menu. Why Microsoft chose to hide this, I have no idea. Once you find it, it’s easy to get to, but I can see lots of folks getting stuck here with no idea what to do. 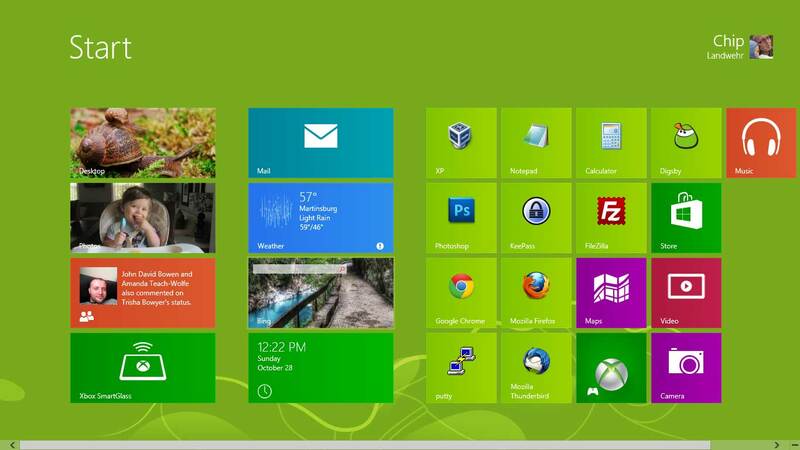 The thing most people are going to love or hate about Windows 8 is the new Metro interface. This is the new mission control center where you launch your programs and go about your daily business. One thing that will undoubtedly confuse people is the handling of programs in this new version. You have “Apps” which run in the above Metro area, then regular Windows program that behave like you are used to. Some programs run both ways. For example Google Chrome (web browser) has both a Metro version, and a regular Windows version now. The difference is the Metro version runs full screen, and the regular version does not. This can be confusing since it isn’t always apparent which version you are opening. I’ve been using Windows 8 for 2 days now doing my normal routines. While Metro is nice once you get used it it, I am finding I spend most of my time on the normal desktop. I do like opening the Metro Start screen before I wander off, as it provides a nice display with email notifications, news, weather, Facebook etc. As soon as I need to do something, it’s back to the regular desktop. As far as Metro Apps, there isn’t a lot there yet , and I haven’t found a single one that I will be using except for Xbox Smartglass. That App lets you control your Xbox from your computer, which makes it easier to play music and launch videos. Now to the meat of this post. Should you upgrade to Windows 8? It’s slightly faster than Windows 7, so that’s a plus. 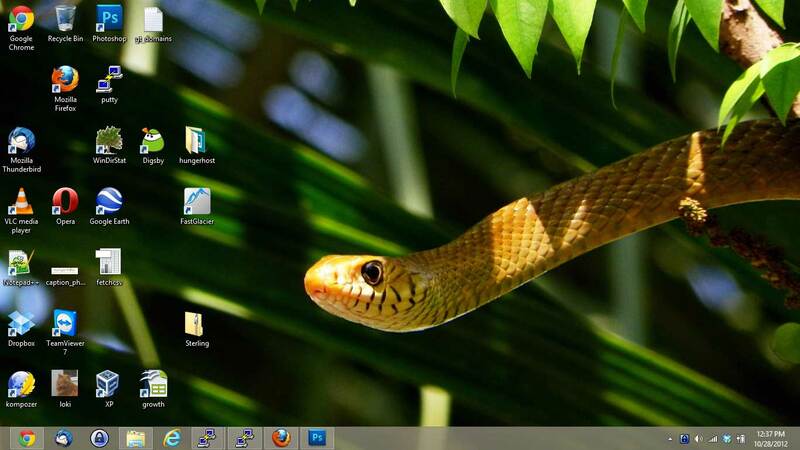 It has a new start menu (Metro) which does have a bit of a learning curve to it. The interface is nice, and getting used to it didn’t take me too long. Stability seems fine, no crashes so far. The only issue I ran into is my Google Chrome icon wouldn’t stay in the start menu. That was frustrating and I’m honestly not sure what I did to fix it. I’m glad I upgraded, but honestly I have mixed feelings if most people will like it or not. What I recommend is go to a store where you can play on a laptop, and see if you like the new interface. Basically what an average user will be getting from upgrading is a new start menu that you might hate or love. To use a car analogy, Microsoft replaced the engine with a better one, redesigned the steering wheel, gauges, and controls, and left the rest of the car is fairly untouched.